Forced Migration Review issue 51 – to be published in November 2015 – will include a major feature called ‘Thinking ahead: displacement, transition and solutions’. The average number of years in which people are living in displacement has increased to nearly 20 years. The challenges that arise when people are forced to flee their homes for any length of time, but particularly when their displacement becomes protracted, are neither exclusively humanitarian nor exclusively developmental. These challenges are faced not only by the refugees, returnees and internally displaced persons themselves but also by the broader displacement-affected communities, including host societies and host countries, communities of origin and potential areas of return, and by those working with them. In addition the need has long been recognised to link humanitarian and development work in the early stages of an emergency in order to influence and implement both immediate and longer-term outcomes. Addressing this combination of challenges has underpinned many initiatives within the humanitarian community over recent decades. Although over the years we may have found partial solutions, deeper understandings and revised formulations, the issues remain largely intractable. Lately these issues have found a new prominence with the Transitional Solutions Initiative, reframed in 2014 as the Solutions Alliance, for addressing protracted displacement. • What are the potential links between humanitarian and development programmes in finding solutions to displacement? Are there practical examples where such links have been explored and implemented in protracted displacements? • What are the potential development impacts – positive as well as negative – of displacement? • Where does displacement fit in the development agenda? What are potential development responses to displacement? • Would greater involvement of development actors in seeking solutions to displacement help challenge resistance to hosting displaced people? • How best can those most directly affected by displacement (refugees, IDPs, returnees) be active participants in these debates and initiatives? • What have we learned from previous initiatives, and how can this inform the latest initiative (the Solutions Alliance)? • What would be suitable legal or regulatory arrangements for supporting a transition from humanitarian needs to viable and sustainable solutions for displaced people? And what would be suitable institutional (social, cultural, economic, political, managerial) arrangements? • How can we find ways to address the political conditionalities that hinder solutions to displacement in the countries of refuge or the countries of origin? • To what extent are displacement issues being addressed effectively through national development plans? What is the role of national governments? • What are the roles of bilateral donors and development banks in supporting or complicating initiatives for humanitarian-development transitions in situations of displacement? • Does the private sector have a role to play? Are there additional (less traditional) actors to consider? • In this context, how can the needs and rights especially of the most vulnerable be protected? • Are there alternatives to, or variations on, the traditional three ‘durable solutions’ that are more conducive to equitable solutions for protracted displacement? What are the risks and advantages of such alternatives? • How can displacement solutions best be monitored, measured or analysed? How will we know that a displacement solution has been achieved? • Do examples exist of effective transitional and durable solutions from which lessons can be drawn? What are the key conditions and drivers for successful solutions for displacement? • In seeking new modalities are there risks to current, albeit unsatisfactory, arrangements? If you are interested in submitting an article, please email the Editors (fmr@qeh.ox.ac.uk) with a proposed outline. Please also consult our guide for authors at www.fmreview.org/writing-fmr. We also welcome articles on other subjects relating to forced migration for consideration for publication in the ‘general articles’ section of the issue. 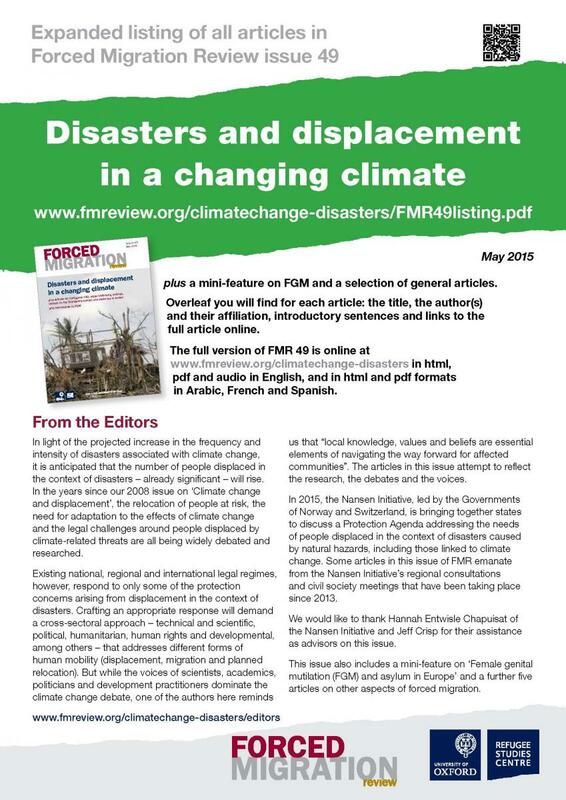 Calls for papers: Forced Migration Review issue 49: Climate change, disasters and displacement (deadline 12 January 2015). Every year around the world people are displaced by floods, cyclones, droughts and other sudden- and slow-onset events. In light of the projected increase in the frequency and intensity of disasters associated with climate change and environmental degradation, it is anticipated that the number of people displaced in the context of disasters, including across international borders, is likely to rise. Forced Migration Review published an issue in 2008 looking at ‘Climate change and displacement’ which brought together researchers and practitioners to debate this growing area of concern – and the tension between the need for research and the need to act. In the years since then there has been much debate, analysis and developments in thinking, approaches and needs. While existing national, regional and international legal regimes respond to some of the protection concerns arising from displacement in the context of disasters, others remain unaddressed. Despite legal standards to protect internally displaced people, significant operational protection gaps remain for those displaced in disasters. Regarding cross-border displacement in disaster contexts, where the 1951 Refugee Convention would not apply, the legal gap relates primarily to admissions, status during stay, and finding durable solutions. International cooperation and solidarity will be essential to ensure adequate protection of the rights of displaced people, while identifying needs and crafting an appropriate response will demand a cross-sectoral approach that addresses different forms of human mobility (displacement, migration and planned relocation). Those working in many different fields – technical and scientific, political, humanitarian, human rights and developmental, among others – will have something to contribute to solutions and to mitigating the impact of displacement. In 2015, the Nansen Initiative, led by the Governments of Norway and Switzerland, will bring together states to discuss a protection agenda addressing the needs of people displaced in the context of disasters caused by natural hazards, including those linked to climate change. While some articles in the FMR issue will emanate from the Nansen Initiative’s regional consultations and civil society meetings that have been taking place since 2013 in the Pacific, Central America, the Horn of Africa, South-East Asia and South Asia, additional articles would be welcomed, in particular those that address the Arctic, Central Asia, Europe, West Africa, the Caribbean and Central Asia.
. What have been the most significant developments in relation to a better understanding of the linkages between climate change, disasters and displacement since publication of FMR issue 31 in 2008?
. What measures can be taken to prevent, or reduce the likelihood of, displacement in the context of climate change and disasters?
. What gaps remain in national, regional and international legal regimes in terms of providing protection for individuals and communities displaced internally or across borders, or facing displacement, in the context of disasters caused by natural hazards, including those linked to climate change?
. How can the operational response be improved, with roles and responsibilities better clarified, when providing protection and assistance for those displaced by disasters and the effects of climate change? What examples exist of states admitting displaced people in the context of disasters?
. Are new methods of data collection, analysis and the use of quantitative modelling proving useful in predicting, planning for and responding to displacement in the context of disasters caused by natural hazards, including those linked to climate change?
. Are there examples of good practice in supporting resilience, adaptation and coping strategies that can be replicated elsewhere?
. What evidence is there of improved guidelines and practice in disaster risk reduction and management, relating to displacement, disasters and climate change?
. To what extent is human mobility included within national adaptation plans?
. How can governments, civil society and the international community work together to help boost the adaptive capacities of local host communities and communities affected by displacement?
. What are potentially affected local communities saying and doing about climate change, disasters and displacement? How can their expertise and insights feed in effectively to planning and responses at the local, national, regional and international level?
. How can pre-emptive voluntary migration or planned relocation, and/or admission to another country to provide temporary protection, be facilitated?
. In what circumstances will both affected citizens and non-citizens have access to humanitarian assistance?
. What is needed in terms of international and regional cooperation and coordination? What good practice currently exists?
. How should governments and other actors respond in order to guard against protracted displacement and avoid premature return? If you are interested in submitting an article, please email the Editors fmr@qeh.ox.ac.uk with a proposed outline. 2014 is widely seen as marking a watershed for Afghanistan with its legacy of thirty-five years of conflict and one of the world’s largest populations in protracted displacement. International military forces are being withdrawn and the country is ‘in transition’ – politically, economically and in terms of security and its international standing. The high voter turnout in the recent presidential elections has been greeted as an encouraging sign for Afghanistan’s future but there is still considerable uncertainty about the capacity of the country to address the challenges of return, integration and reintegration, protection, access to rights, and continuing displacement. FMR 46 contains 21 articles on Afghanistan, plus a mini-feature on Statelessness. The full list of contents, with web links, is given below. 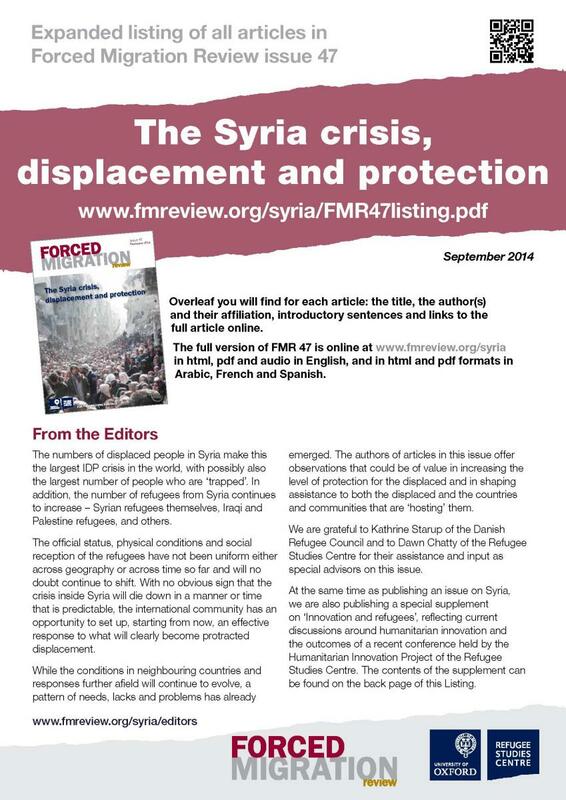 FMR 46 will be available online and in print in English, French, Spanish, Arabic, Dari and Pashto. We are very grateful to the following organisations for their financial support of this issue: Norwegian Refugee Council, Open Society Justice Initiative, Swiss Agency for Development and Cooperation (SDC)/Swiss Cooperation Office – Afghanistan, UN-Habitat, UNHCR Department of International Protection, UNHCR Office in Afghanistan and the UN Office for the Coordination of Humanitarian Affairs. See www.fmreview.org/forthcoming for details of forthcoming FMR issues on Syria, Faith-based organisations, Climate change and disasters, and Dayton+20/Balkans. Afghan returnees as actors of change? Unaccompanied Afghan children: on the move again?